You want to know and do God’s will? What is God’s will and what would it look like to do it? Usually the questions arise over something specific: Should I marry this person or that person? Should I become a pastor or a plumber? Things like that. But to know those things we need to approach the will of God first in a more foundational way. Instead of asking immediately should I live in Dallas or Denver, we need to ask if there a basic pattern to God’s will and how He reveals it. Is there something consistent we can look for whether we’re talking about choosing a marriage partner, an occupation, or a city to call home? God willed that Jesus would suffer for our sins (“to crush him”) and only then would the fullness of His will find fulfillment through Him (“prosper in his hand”). Jesus died for us once for all, making the only atonement possible for our sins. We can’t duplicate that, and shouldn’t try. But there is something about the pattern of God’s dealings with Jesus that He wishes to reproduce in us as well. Notice this order: the cross (“crush him”), then a crown (“prosper”). Death, then resurrection. Suffering, then reward. Crushed, then crowned. Battered, then blessed. Why this pattern? Why did Jesus travel this road for us? Not because of something in Him, but because of something in us. He died for our sins on the cross. But, even though we are forgiven and free of the debt of our sins, our sin nature continues to exist while in this world. To deal with the indwelling nature of sin, God takes us down the same path He led His Son along. We can’t pay the debt of our sins, but we must die to sin—the inward nature that resists God. We can’t truly enter into the enjoyable part of God’s will (“prosper in his hand”) until God deals with our sin nature (“crush him”), for it repeatedly blocks our way. Thus, at this present moment, God is orchestrating some of the events of your life in a way that is unpleasant. One (perhaps among many) purpose for this is that He is wooing you to choose His will rather than your own will. What is God’s will? That in everything and at every moment you choose His will over your own. Didn’t Jesus say, “Not my will, but your will be done”? Could it be that what you are facing presently is in some respect designed to bring you to that same posture of heart? The cross hurts. The crushing of self is never pleasant. But it is God’s will. Are you wondering why things have to be so hard? At least in part, things are hard because your self-will is hard. You want your way! So do I! That is the problem. Remember, the required heart-posture for discovering the God’s will is this: I want His will more than I want my own. Jesus willingly walked this road for us. He didn’t have to—for He had been in harmony with the will of the Father from all eternity. But He stepped into time and space and followed His Father’s will. And it led Him to a garden where He prayed in agony to choose the Father’s will over His own will. The result was resurrection from the dead and elevation to a place He could not and did not even enjoy prior to His earthly ministry—for now it was His not simply by divine right as the Son of God, but now by redemptive right as the Savior of the world! We must travel the same path to find and do His will. Though initially the path is painful, in the end we will find it to be “his good, pleasing and perfect will” (Rom. 12:2b). So we are commanded: “Do not conform any longer to the pattern of this world” (Rom. 12:2a). This is the crushing. We have all allowed the world to “squeeze [us] into its own mould” (Phillips). Breaking that pattern is painful, but we can never know and do the will of God until it is accomplished. This is not accomplished in a moment of time (though it begins there), but is a life-long process. Yet we need not wait a lifetime to “be transformed by the renewing of your mind” (knowing the will of God). And the promise is “Then you will be able to test [identify] and approve [rejoice in] what God’s will is—his good pleasing and perfect will” (Rom. 12:2b). God wants you to know who to marry, what occupation to take up, and what city to live in—but more than that He wants to own you, from the heart. Then you will know and rejoice to do … whatever His will is. 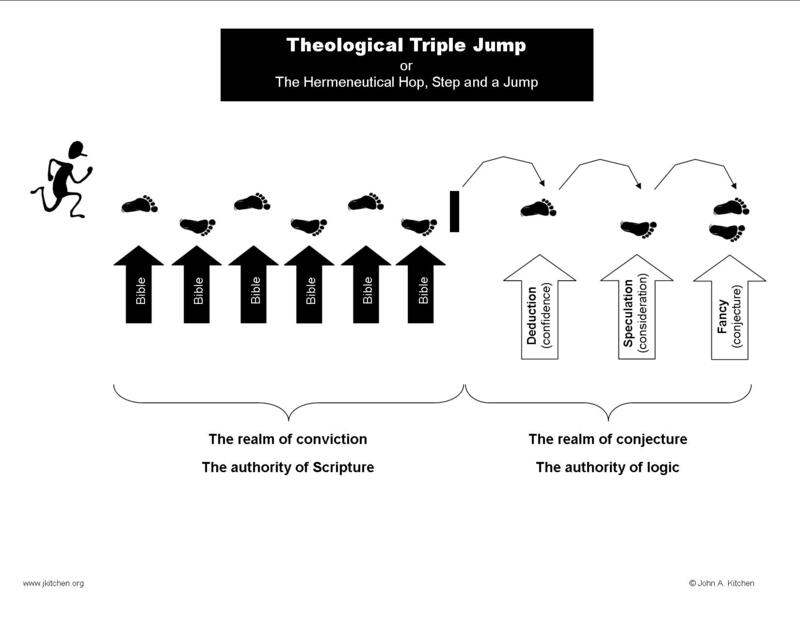 How does this theological triple jump show itself when we think through some specific issue? Let’s take the issue of suffering as a test case. This seems reasonable, for we are assured in the Scriptures that suffering is an integral part of the Christian’s experience in this life. But why do we suffer? 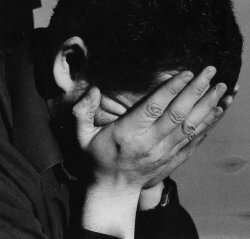 You might find in the Scriptures other purposes of suffering. 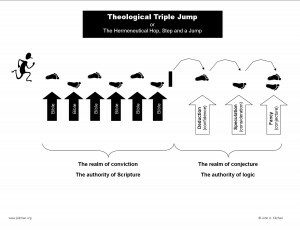 My intent here is not to build a complete theology of suffering, but to help us see just how the theological triple jump affects how we think of what the Scriptures say and how it applies to what we experience. Why this particular form of suffering? Why is this particular person suffering? Why is this occurring at this particular time in this person’s life? But do we know this? We have divine warrant to conclude this could be the purpose of this particular person’s suffering, but do we have Scriptural authorization to announce that it is the reason in this person’s life at this time? No. Perhaps their suffering is God’s discipline, but we do not know that with revelatory certainty. So what do we make of this friend’s conclusion? They have taken the first step into the realm of conjecture. They have made a deduction. There can be some level of confidence in the possibility of this, assuming for the moment some other factors in the person’s life. But we do well to remember that confidence is not certainty. Having concluded the person is suffering as a form of divine discipline, the next question is why has God chosen to discipline this person? Perhaps the “friend” goes on to declare that God is disciplining the person because of some disobedience in their life. This is the second leap into the realm of conjecture. This is speculation. Could this be the case? Yes. Is it in fact the case? Do we have certainty of this? No. The “friend” should have stated their case as a consideration for their friend (Is there any cause for God to bring discipline into your life?) rather than a fact. The third question might be, “Why is this occurring at this particular time in their life?” Perhaps the person’s “friend” believes he has an answer to this as well – it is because of a failure to spend sufficient time in God’s Word each day. Does this “friend” know this in the sense of revelatory, Scriptural certainty? No. Even if he has evidence that his friend has indeed not been reading God’s Word each day, he does not know that this is God’s reason for allowing this suffering at this time. He has entered the land of fancy and is basing his conclusion on conjecture. He is now three steps beyond the realm of conviction based upon the authority of Scripture and is full into the realm of conjecture based upon the authority of logic. It is not difficult to imagine the many ways these three leaps beyond the solid ground of Scriptural truth could compound the suffering man’s pain. But what should the “friend” have done instead? Should he only have shared, at appropriate times and in appropriate ways, what Scripture teaches about the possible purposes of suffering? This he could do with conviction and as a way of truly helping his suffering friend. But what of these additional questions? He should not ignore them, but rather put them in appropriate context. He should treat any answers to those questions for what they are: deductions, speculations, and fancies based upon human (even if Spirit-controlled) logic that might be a legitimate extension of the trajectory of Scripture’s clear teaching. He should state them as something that reflects not certainty, but varying levels of confidence, consideration and conjecture. He can sensitively help his friend explore these possibilities, but should stop short of making declarations supposedly backed by divine authority. All of life is to be processed Biblically. As we think our way through life we attempt, rightly, to process life theologically. As we make our way down the path of life one step at a time, we attempt to plant our feet on solid Bible truth. We aim to make each thought correspond to truth that can be identified with a chapter and a verse. We want to think the thoughts of God after Him. In this regard God’s revelation is full and sufficient (2 Tim. 3:16; 2 Pet. 1:3-4). All that God has told us is true. Yet God has not told us all that is true. There remain matters which are not revealed to us. “The secret things belong to the LORD our God, but the things that are revealed belong to us and to our children forever, that we may do all the words of this law” (Deut. 29:29). God is beyond tracing out (Rom. 11:33). No amount of mental exertion will allow us to break through beyond the veil of revelation. We can’t figure God out. He is infinite. We are finite. We are at the mercy of His revelatory grace. What God has revealed is clear. What God has not revealed remains a mystery. We may rest assured that what is not revealed will be consistent with what has been revealed. We are not, however, exactly sure just how that consistency extends out beyond what God has revealed of Himself and His ways. What God has revealed is breathtaking (Rom. 11:33-36). What God has not revealed remains a mystery. To this end we must be wise as we approach the limits of God revelation on any given subject. There comes a moment in our step-by-step process of thinking through life Biblically that we reach that boundary of what God has clearly revealed. Beyond that boundary we must tread cautiously. God is rational. God has made us in His image, part of which is being rational creatures ourselves. Thus logic is a gift from God. But the limits of our finite minds fetter this gift from its perfect fullness, at least in this life. We are welcome to telescope our thoughts logically outward from what we know clearly from the Bible. This is where the “hop, step and a jump” of theological thought come in. We reason our way through the Scriptures, under the ministry of the Holy Spirit. But then, having come to the limits of what God clearly says, we make a logical leap—a deduction. This deduction is a logical leap launched from solid Biblical truth with a chapter and verse. Yet the deduction itself does not have such clear, firm footing. This deduction makes sense to us and we may feel a sense of confidence in our conclusion, but the ground beneath our feet is less solid than just one step prior. From this we may take another leap, logically of course. This we might call speculation. This is worthy of our Biblically-informed consideration. In eternity it might even prove to be true, but we don’t know this with revelatory certainty. Awareness that we are presently two steps removed from the firm footing of solid Biblical revelation is urged. It doesn’t mean the thought is untrue necessarily, but our level of confidence in that thought and particularly our level of confidence in pressing this thought upon others is diminished. God wants us to live with conviction, based upon a clear understanding of what He has clearly revealed to us in the Bible. We can thus live under the authority of Scripture. God invites us to think! The ability to launch into the realm of conjecture is a God-given gift, but one which comes with an appropriate warning label. In the land of conjecture any deductions are made on the authority of logic (flawed and fallen and not yet fully transformed, Rom. 12:2), not on the authority of God’s revelation in the Scripture. February 15, 2010 / admin / Comments Off on How Long? Oh the patience of God! In his first letter Peter writes to people facing significant pain. He wastes no time in bringing perspective to the pain we all experience in this life. This proves that an accurate perspective has a wide enough view to acknowledge both the reality and gravity of pain, and yet also embrace the hope of God’s grace. Indeed, by God’s wonderful grace Peter affirms that we share in, experience, and anticipate the fullness of a salvation which 1) prophets searched for, inquired into, and longed to understand (v.10-12a) and which 2) angels “long to look” into (v.12b)!